What does ATG do? It is the "leading provider of Quote-to-Cash advisory and implementation services." Now, for those unfamiliar with the Quote-to-Cash term, it seems to be best defined as the full set of business processes involved in selling - from lead generation to billing and collecting payment. According to Salesforce, it begins with configuring the offer, developing the appropriate pricing, and creating the quote. It continues on through negotiations, invoicing, payment, and even renewals and renegotiations. ATG's Quote-to-Cash solution is built to streamline and automate these processes, giving businesses greater efficiency. What's the skinny on them? Tom Stergios, a Missoula native, opened the Montana ATG office in 2011 after working remotely with the Missouri-based firm. He worked around the world in the tech industry before returning to his hometown to raise his family (a familiar story for many Montanans). The Missoula Solutions Center is now ATG’s largest office, surpassing the offices in Denver, Cincinnati, Kansas City, St. Louis, and Dallas. ATG is one of the fastest growing tech companies in the state, injecting more than $18 million into Missoula's economy each year. It's also worth mentioning that the company just hired its 100th employee in its downtown Missoula office! Read more about the hiring of its 100th employee in the news here. Top Missoula jobs can be hard to come by, and the company is currently hiring for a number of Missoula positions on its website here. You can also read more about ATG here in a recent article written by the Montana High Tech Business Alliance. 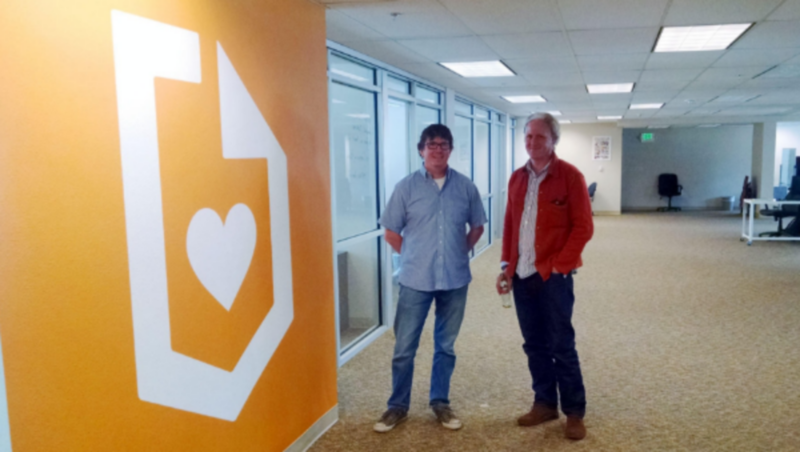 John Brownell and Michael FitzGerald, founders of Submittable, stand in their office in the Florence building. What does Submittable do? Its software allows your business (and specific people or teams within your business) to review, rank, comment on, and accept/decline any kind of content submissions. A submission could be in the form of documents, forms, images, audio or video files. For example, imagine you're looking to hire an intern, you can easily accept, rate and evaluate incoming applications for the internship all in one spot with your team. For publishers, it makes finding, evaluating and choosing content (articles, images, videos) for a publication much simpler by centralizing the submission, payment and management processes into a single online location. Or, use Submittable to create your next RFP and to centralize your team's vetting process. These are just a few examples of how 10,000+ companies (e.g. Airbnb, The New Yorker, NCAA, National Geographic) are using Submittable. What's the skinny on them? The company hasn't done any advertising since it was founded in 2010 - growing completely organically. In June (2017), the company raised $5 million in Series A investment funding led by a Silicon Valley-based investment firm to fuel focused sales and marketing efforts and mobile product development. It also appears to be evolving (or growing) itself into a content marketplace - where anyone looking for content can find it...and anyone creating content can find venues to share it. Check 'em out. They also have a few Missoula job openings they're currently hiring for featured on its website. You can read more about Submittable here in a recent article published by the Missoulian in June 2017 or here in an article published by TechCrunch. Superhero Friday adds an extra level of fun and teamwork to an already positive office vibe at Orbital Shift. What does Orbital Shift do? Orbital Shift is an easy-to-use staff scheduling software that enhances overall employee communication - with features like online time tracking and a mobile time clock (where employees can clock-in/out with one click on almost any device). Orbital Shift has a large (and growing) client base across many verticals - grocery, healthcare, hotel and restaurants, to name a few. What's the skinny on them? In November 2016, the Missoula tech startup closed a $1.25 million funding round led by Next Frontier Capital, and with participation from angel investors. While those at the company are working hard every day to revolutionize workplace management for employers, they still find it a top priority to inject fun and teamwork into the office culture (e.g. like the implementation of Superhero Fridays, where employees dress in some sort of superhero or pop culture-related attire for a chance to leave the office early). 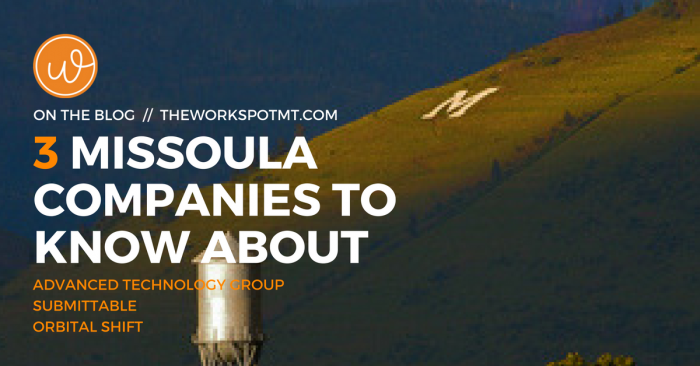 In a nutshell, the company values its company culture and employees, has a lot of positive testimonials to brag about, and also has some open Montana job opportunities in Missoula and Bozeman you can find here.